Baltimore Jewish Life | Did Trump Interfere In Israel's Election By Sharing Netanyahu Instagram Post? Did Trump Interfere In Israel's Election By Sharing Netanyahu Instagram Post? 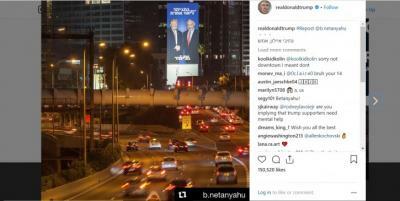 Jerusalem - US President Donald Trump on Tuesday reposted an Instagram post from Prime Minister Benjamin Netanyahu’s account of a billboard hanging over the Ayalon Highway in Tel Aviv. Trump shared the photo on his official Instagram account and, as evident from the bottom right corner of the post, directly reposted it from Netanyahu’s account, including the Hebrew caption. The post gathered over 100,000 likes so far and more than 3000 comments, raising concerns about election interference.